J. J. Lankes, whose woodcuts illustrated New Hampshire, A Further Range, and several Christmas cards shared a friendship with Frost for almost forty years based on their affection for rural life. Lankes had executed Frost-inspired wood cuts before meeting the poet simply for "the sheer love of the thing." Frost in turn noted, "I liked your work before I knew you liked mine; you apparently liked mine somewhat before you knew I liked yours. Such a coincidence of taste can never be forseen. It ought to settle it between us." Lankes painted Frost's Gulley Farm looking north towards Mount Equinox about 1939. Autograph manuscript of short stories by Lesley Frost and kept while the Frost family lived in Plymouth, New Hampshire. "AN IMPORTANT YEAR BY FOUR CHILDREN"
Autograph manuscript notebook dedicated to "Papa and Mamma," written while residing in "The Bungalow," Beaconsfield, England, and containing diagrams, short stories, poetry, illustrations and maps. 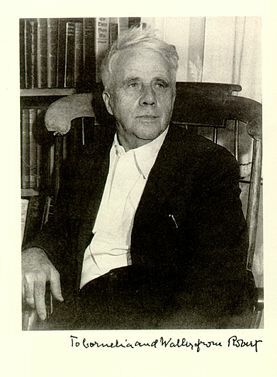 Workbook of Robert Frost, in part childrens' stories, kept in Derry New Hampshire. 44 p. on 32 l.
Frost wrote eighteen stories for his children's amusement during the bitter winter of 1906-1907 while he was teaching at the Pinkerton Academy and the family was living on Derry Farm. 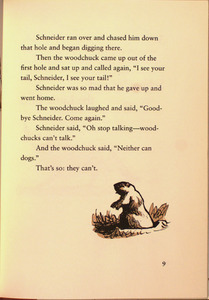 The short stories relate the adventures of Lesley, Carol, Irma, Marjorie and their collie Schneider who could make so much noise that President Roosevelt heard them in Washington. 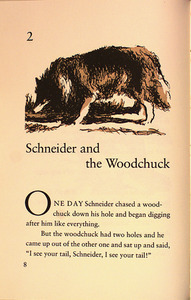 Warren Chappell, University of Virginia artist-in-resident, designed and illustrated this first publication. Frost's youngest daughter Marjorie Frost Fraser, age 29, died in May 1934, shortly after the birth of her first child Marjorie Robin Fraser. Two years later her posthumous book of poems was printed privately for the Frosts by the Spiral Press. 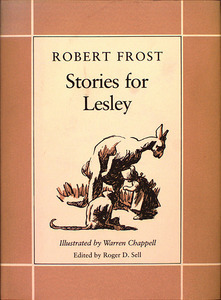 Frost's oldest daughter Lesley published two books of children's stories, Really Not Really and Digging Down to China. Both contain the adventures of Elinor, Lee, Ricky and the Giraffe, and were based on stories told by Lesley to her daughters and grandchildren. Digging Down to China was illustrated by Frost's granddaughter Robin Fraser Hudnut.